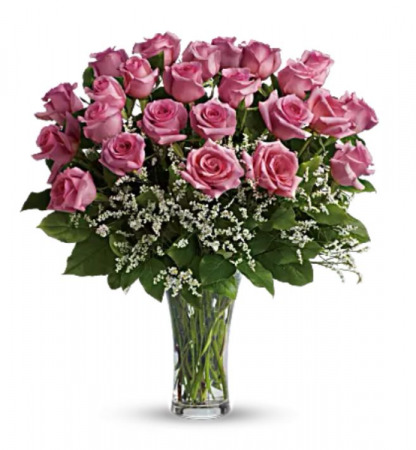 Two Dozen Pink Roses Are Gathered With White Limonium And Rich Green Salal In A Classic Trumpet Vase Shell Use Again And Again, Orientation: Allaround. 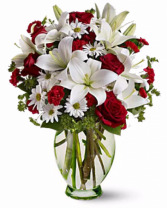 Red Roses, White Asiatic Lilies, White Daisy Spray Chrysanthemums, Mini Red Carnations And Sprigs Of Bupleurum And Salal Are Presented In A Graceful Glass Vase, Orientation: Onesided. 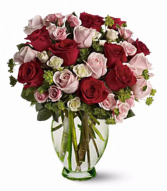 Standard Orders Will Be With Red Roses Unless Specified Specific Color Pick From Red, Pink, White, Lavender, And More Please Put Desire In Instructions Upon Placing Order. Hand crafted luxury quality flower box. 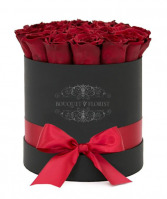 About 20-25 stems (Depending on Size of Roses) of Quality Ecuadorian Roses.